Both are hard biological filtration media intended for static use either fully submerged or in wet/dry style trickle filters. Other similar products of the same type include ceramic rings, sintered glass noodles, coral bones, scoria, matrix and aquaclay. They all do the job, the more fancy ones are capable of supporting more microbes in a smaller filter compartment. If you have a large filter though you can use P for plenty to get good results with lots of the cheaper stuff. I have 2 x 406 running in the same tank. I changed out the ceramic tubes with MarinePure and the flow rate increased and remains higher. I put marine pure spheres into a bag made from ladies nylons in my canister and found that I was getting a lot of little pieces like a fine white mist in my tank..when I took them out they had shrunk and become more potato shaped than round..is there a way around this? and is this normal?..I was wondering if they needed maybe to be packed in tightly or something...??? Weird mine have never done this and been bashed around plenty.... Is it in a cannister or sump? Might pay to pack the Marinepure a little better - if you rub them together the friction against each other will take a small amount off them - it might not be so much the hitting each other but the rubbing. 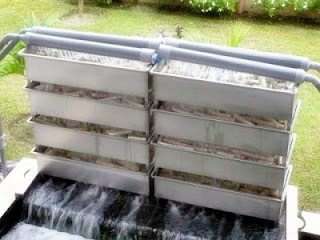 Bakki was originally a filtration system with big Koi Farms with Bakki Shower filtration systems and has graduated to where a lot of the exotics and ray people like to use the Bakki - there will always be an argument for which one is better but they are both extremely good filtration media's. @<a href="http://www.qldaf.com/forums/member.php?u=7637" target="_blank">yellows</a> have a google search on bakki shower. [MENTION=7637]yellows[/MENTION] have a google search on bakki shower. It is a oddessey 500 canister filter. I use both, I find the bakki performs better being not submerged with a water shower. I use this way in my sump, then under that I have 10 litres of MP spheres. They are both just as good as each other IMO. I am keen on using the cubes as I think they would stack better than the spheres and the rubbing wouldnt be as bad. [MENTION=8538]blocka[/MENTION] - sorry I wanted to get a photo for you but it was a bit nuts with the long week end roll over and did not get a chance but from memory a litre of mp is approx 400g so weight wise there would be approx 12 litres or so to 5kg of weight. Is that what you were asking? sorry, replied on a wrong thread. Undecided whether to get some bakki balls vs marine pure. Already have marinepure but have not tried the bakki balls yet. Any feedback of people using the bakki balls.